Definition: The Hypothesis Testing is a statistical test used to determine whether the hypothesis assumed for the sample of data stands true for the entire population or not. Simply, the hypothesis is an assumption which is tested to determine the relationship between two data sets. In hypothesis testing, two opposing hypotheses about a population are formed Viz. 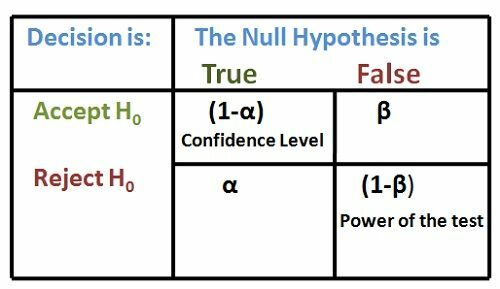 Null Hypothesis (H0) and Alternative Hypothesis (H1). The Null hypothesis is the statement which asserts that there is no difference between the sample statistic and population parameter and is the one which is tested, while the alternative hypothesis is the statement which stands true if the null hypothesis is rejected. Type-I Error: True Null hypothesis is rejected, i.e. hypothesis is rejected when it should be accepted. The probability of committing the type-I error is denoted by α and is called as a level of significance. (1-α) = corresponds to the concept of Confidence Interval. Type-II Error: A False Null hypothesis is accepted, i.e. hypothesis is accepted when it should be rejected. The probability of committing the type-II error is denoted by β. (1-β) = power of a statistical test. Thus, hypothesis testing is the important method in the statistical inference that measures the deviations in the sample data from the population parameter. The hypothesis tests are widely used in the business and industry for making the crucial business decisions.